Newcomers and immigrants feel disconnected in a new country. It is hard to mix in with the locals and get insider information. Even when they have a network, most newcomers often feel like outsiders when they arrive in a new country. When struggling in a new city (e.g., finding housing, getting around) people usually reach out to social media and blogs. Yet these platforms can be really chaotic with no promise of answering your needs or getting any help. “Mygreat” aims to solve this problem by providing a networking platform through visual content sharing between locals and newcomers to link them before they even arrive. The service allows newcomers to view experiences of others who have been through similar challenges, or experiences of those who are natural-born citizens. The service also allows you to connect with people who are due to arrive in the same time period which reinforces the feeling of shared intent or common fate. People ultimately need reassurance that everything is going to be alright when they arrive in a new country – it helps to share these feelings with others. There are many initiatives launched by immigration services in different countries to link newcomers with locals based on similar interest. In Copenhagen alone, there are numerous programs run by the “International House” to facilitate this conversation. There are specific meet-up events organised to introduce life in Copenhagen to newcomers. Yet these programs have very low success rates with high dropout and low engagement. Most newcomers and locals see these initiatives as a huge commitment. Also, a government institution facilitating this conversation is seen as “unnatural”, “not fun” or “too bureaucratic” to a point where people shy away from participation. 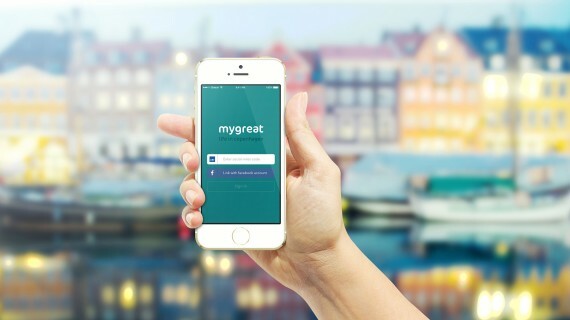 “Mygreat” collects all these initiatives under an umbrella to connect newcomers and locals in the most natural way possible – by engaging users through visual content. Sharing snippets of life with strangers is becoming a common day practice as services like Periscope and Snapchat gain popularity. “Mygreat” banks on this recent tradition and brings the seemingly uncomfortable activity of “meeting strangers” to a fun world of sharing media content. In a world which is becoming more mobile, services like this will be needed more and more. People on the move or have the privilege to choose where they want to live can look through the window of “Mygreat” into different worlds and start imagining their future lives right away.